Have you ever been at a place in your life where one thing falls upon another thing, another thing fall on top of another and on and on it goes? You get to that point where you just want to throw your hands up in the air and cry out, “I give up! I am done! I don’t have the strength to keep going on!” I do not like that place yet, that is where I had been for far to long! It was demanding, draining, and demoralizing. Every ounce of my being felt like had been tugged at, tested and tried. The thing is I know there is more on its way. I am not being negative about it. It is just the truth. A truth that hurts, reveals and rebuilds. I definitely do not have all the answers. I am not even sure how encouraging I may even be. However, I do believe we have a choice when we find ourselves in this place. That choice is going to define who we are. Yes, at times over the past few months I have wanted to give up! I wanted to be done! I did not feel like I had the strength to carry on! Then God showed up in ways that I could see Him because I was blinded in my brokeness and self-pity. He reminded me of who I am, whom I belonged to and that He loved me very much. Soon I will be sharing these storms/trials/interruptions and the lessons that I learned along the way. Until that time, I would like to share this truth with you. James, the brother of Jesus tells us a truth that has been my life line these past few months. I held onto this truth because I have seen this truth play out time and time again in my life. It’s hard to consider it all joy when your brain, body and soul are beaten, battered and worn. Yet His strength is made perfect in our weakness. He guides us through these obstacles/trials/storms not to destroy us but to build us. To build us up in Him. To give us hope, His hope. To give us love, His love. To give us all that we need, His all! For without Him, I would have no hope, no future and no way of making it through these obstacles/trials/storms without becoming more broken than I already am. 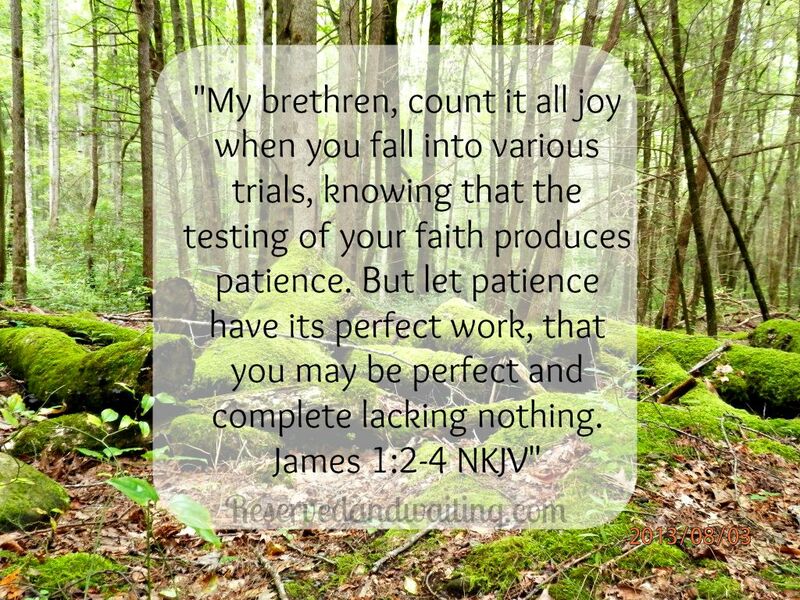 As my faith is being tested, I know God is with me and these areas in my life are being refined as I seek Him, obey Him and allow Him to do His work in me. Then I will be able to look back and see once more what God has done in my life.